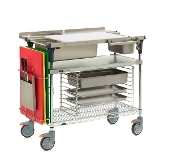 Metro’s PrepMate is a multifunctional workstation designed around the end-user to eliminate space constraints and increase overall productivity, enabling you to chop, slide, clean, store or serve in a smaller footprint. PrepMate is efficiently sized and accessorized to maximize space and allow for a streamlined process and workflow. The PrepMate Multi-Rail maximizes your workspace by holding work surfaces above containers, creating a dynamic system for preparation that will increase your productivity by up to 20%. Application based PrepMate, offers eight pre-configured models with varying construction options that include solid stainless shelves, solid galvanized steel shelves, Super Erecta Pro Hybrid removable mat shelves, MetroSeal epoxy coated wire shelves and Brite zinc wire shelves. Each available in four shelf sizes with adjustments in 1” (25mm) increments. Equipped with four Total Lock casters, PrepMate allows for mobility of tasks in multiple locations, saving time and labor. Casters wheels and hubs are easily locked into place to provide a stable work surface. In addition, PrepMate’s flexible Multi-Rail holds standard 18” cutting boards and food pans, allowing for quick set-up, executions, clean-up and change-over. The Multi-Rail End Cap Design allows for five working height adjustments ranging from 35-1/8" to 39-1/8". NSF Listed. Load Rating: Multi-Rails: 800lbs (363kg) per set*; Shelving: 800lbs (363kg) each; Casters: 220lbs each (100kg); Static System: 800lbs (363kg). *Multi-Rails are capable of holding 800lbs evenly distributed on an 18"x24" work surface of sufficient strength centered in the unit. For product specification sheet 17.50, click here. PrepMate MultiStations may be customized with additional/optional PrepMate Accessories. Cutting Boards, Knives and Pans shown in photos are not included. AMS1836-FGBR, 19.4"x38" (493x914mm), Solid Galvanized Top and Brite Wire Zinc Bottom Shelf, Chrome Posts, includes (1) MS-SE18 Work Surface Extension, (1) MS-DE18 Drop-In Extension, (1) MS-UB18 Utensil Bar, (1) MS-SPH Pan Holder, (1) MS-CBE Cutting Board Holder and (1) MS-KNIFE Knife Holder. AMS1848-FGBR, 19.4"x48" (493x1270mm), Solid Galvanized Top and Brite Wire Zinc Bottom Shelf, Chrome Posts, includes (1) MS-SE24 Work Surface Extension, (1) MS-DE24 Drop-In Extension, (1) MS-UB24 Utensil Bar, (1) MS-SPH Pan Holder, (1) MS-CBE Cutting Board Holder and (1) MS-KNIFE Knife Holder.